The pharmaceutical industry relies on pure water to manufacture life-saving drugs. Water treatment systems, especially in this industry are a critical investment and must conform to the highest safety and quality standards. It is important to protect your investment and ensure that the smooth functioning of your water system. We’ve pulled together this list of common mistakes that you can avoid to get the most out of your water treatment system. Using pharma grade water for other processes is waste of resources and this water is the most difficult and expensive to produce. Not every piece of pharma or process equipment requires water less than 1.2 µS/cm water. Water used for drinking, washing, CIP/SIP and other utilities only need a conductivity between 10 – 50 µS/cm, as long as it is RO Purified water. 5-micron filters commonly used in an RO may be adequate for a well water source with little or no TSS, but they cannot be expected to reduce the SDI of the water and do the job of an ultrafiltration skid. This is a very common technique to reduce costs which proves extremely expensive in the long run. SDI will choke RO membranes and possibly shut down the purified water system. Also cleaning the RO membrane frequently will reduce membrane life. It is imperative to identify the correct SDI content in the water. Not only is this critical but inevitably overlooked in most source water content analysis reports. If the water comes from a surface or groundwater source, chances are you will need UF and maybe even multimedia filters ahead of the UF. 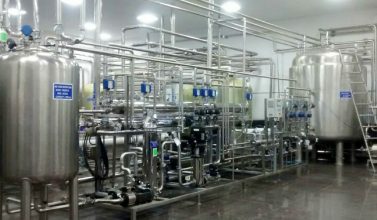 Water treatment systems at any level of automation still require trained operations and maintenance personnel to ensure the equipment operates correctly. Operators must also be knowledgeable about how the equipment works and how to identify common problems. It only takes a few hours without the scale-inhibitor (antiscalant) chemical to irreparably damage membranes. Personnel who are well trained will know how to trend equipment pressures, flow rates, and conductivity to anticipate the need to clean the membranes, for example. This saves costly membrane replacement. Both RO and ion exchange systems require handling chemicals, so personnel know how to handle them safely. Regeneration of ion exchange equipment is a particularly critical time; you are often one valve away from disaster. Training is a small investment with a big return. The operator also needs to maintain proper log books during operation of the water system which helps with the precise identification of when and where the problem occurred, how critical it is and what corrective steps need to be taken. While the source of the water is often considered when designing the water system, more often than not it changes after the system has been installed for various reasons. If ground or well water is considered during the design and installation stage, tanker water may be used during the summer months owing to a depleted groundwater table. These changes should be anticipated and considered when designing the water system so it can be designed to work with a combination of sources. If combination sources are not considered, it will lead to the choking of RO plant membranes and the desired output will not be achieved. RO membrane specifications have a recommended flux rate – gallons of permeate per sq ft. of available membrane surface area per day (GFD). But this flux rate varies by the type and temperature of the water. The higher the operating flux rate, the higher the risk of fouling the membranes and the more often they will need cleaning. It is always advisable to use the lower end of the recommended flux rate for your water source. Be sure to consider the flux rate at the lowest water temperature you are likely to encounter. All manufacturers have their membrane software package for designing an RO system which can be downloaded from their respective websites. They are simple to use and helps in the optimal design of a membrane array. Whether designing or simply evaluating design bids, this can be very helpful. Avoid common and rare mistakes with your water treatment plant. Talk to our water experts and we’ll guide you through every potential minefield. Use the form below to get in touch. I'd like more information about your high-quality water systems. Never miss a post from Fabtech. Sign up to receive updates direct to your inbox. We are a world leader delivering start-to-finish (turnkey) engineering solutions for pharmaceutical, biotech and healthcare companies all over the world. We are trusted by over 1000 customers in 53 countries. Our mission is to make medicines affordable and accessible everywhere by building pharmaceutical and healthcare capability.